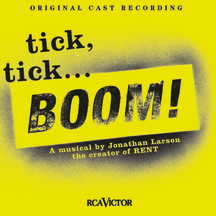 An early musical by the composer of Rent, Jonathan Larson, tick… tick… BOOM! opened on May 23, 2001 at the off-Broadway Jane Street Theatre where it played 215 performances. Originally written as a one-man show, which was performed by its author at the off-off-Broadway Second Stage Theatre in September 1990 and at the Village Gate in November 1991, about a would-be composer in New York City questioning his choices in life, it was reconceived by David Auburn as a three-actor play, with Raúl Esparza, Amy Spanger and Jerry Dixon.